Students of all ages, how are your coding skills? Why not try the challenges on CodeMonkey? This is a great way to learn to code if you have little experience – and still fun if you do have some coding skills already. There are 30 challenges to try which are all free. Can you help the monkey get all his bananas? Look at this simple example – challenge#8; click on the image to see this solution. Note that you learn about loops in later challenges. After each challenge is successfully completed, you will receive a number of stars, note the meaning of each. Did you get all the bananas? Did you use what you learned and were you efficient in your coding? or share your great code! You can follow CodeMonkey on Facebook or Twitter. Click on the image and then on the slider! Note this was a special for Valentine’s Day. Look out for this next time! …to the one you love – or any of your mathematical friends! Note that this was a special for Valentine’s Day – look out for this next year! 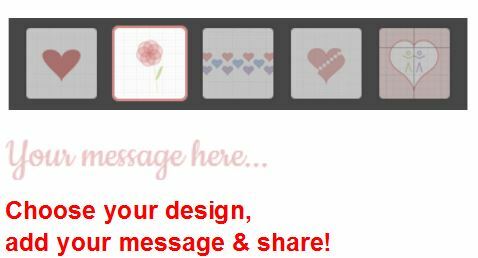 Choose one of the supplied romantically mathematical designs, add a custom message and send it off! Being a Desmos math-o-gram there’s more – using the slider, the hearts on this design will dance! (Click on the image). Sending Valentine good wishes to mathematicians everywhere! ….and in case you have not used Desmos before you might find some of the posts on this page useful. There are many excellent puzzle sites freely available, have you seen the excellent Set Game from the New York Times? How many sets can you find? Click ‘How to play’ in the menu on the left for the rules. A new puzzle is set every day. Other favourite puzzle sites are provided here on Mathematics – Games. Erich Friedman’s Puzzle Palace site for example includes numerous mathematics puzzles. Another great collection comes from Simon Tatham, I have been enjoying his ‘Untangle’ puzzles; note that it is possible to change the number of nodes – use the Type menu. You may be familiar with Suduko and Kenken type puzzles, have you seen Rogo? Wishing students everywhere a very Happy Christmas. Good luck with any examinations you may have early in 2013. This has been doing the rounds on the Internet recently. This problem can be solved by pre-school children in five to ten minutes, by programmers in an hour and by people in higher education ….well, check it yourself! I’m pleased to say despite my various Maths degrees I solved the problem quickly! I obviously have the mind of a pre-schooler! You can find a hint then check the answer here. I present the problem as posed everywhere – though it looks like a misuse of the = sign! Only put an equals sign between equal expressions! How about some mathematical songs?! (Click the link for a list of song links). My students like these, particularly the Circle Song! The Klein Four are a bit beyond school Mathematics you may appreciate this if you are studying a Mathematics degree! You may have tried the Sporke site with its extensive collection of timed quizzes. There are several mathematics quizzes available. It is also possible to create your own quizzes, give the link to your friends and see how they do! Can you give all the missing prime numbers in 2 minutes or less? Can you square the numbers from 1 to 25 in 2 minutes or square the numbers from 1 to 50 in 4 minutes?! Can you get the correct answers to 60 simple calculations in 1 minute? A mistake will end the quiz.